I was in Switzerland recently, and the moment I laid my eyes on the snow-clad Alps providing the most picturesque background to the lush green cow specked slopes, the ever present Hindi film buff “nautanki” in me struggled not to break into a jig with a chiffon draped saree singing “Tere Mere hoton pe mithe mithe geet mitwa”…! 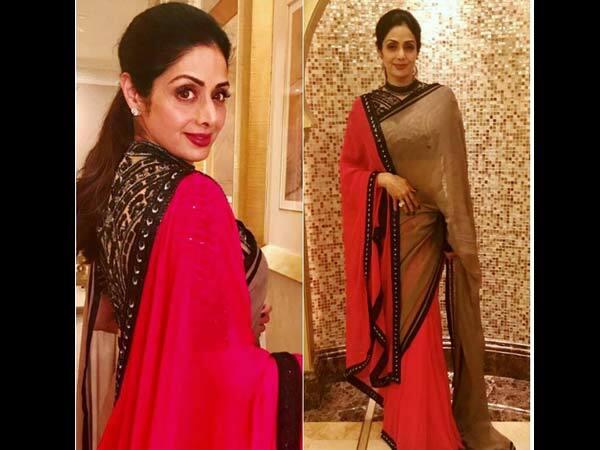 I think all of us girls who are obsessed with the Saree can’t help being head over heels with the Big S-Trinity of Bollywood – Sridevi, Saree and Switzerland. Am I right or what??!! There is something about the yesteryear leading ladies and the saree that is just so Yin-Yang, that we can’t think of them without being draped in mouth-watering sarees. Whether it is the gorgeous chiffon yellow saree in Chandni, or the red-hot saree in Jaanbaaz, whether it is the rain-clad blue number in Mr.India or the super elegant simple sarees in English Vinglish – Sridevi managed to create movie history in all of these and many more!! And yet, just like the age-old cliché about aging wine, Sridevi looks her most gorgeous and delectable self today – still rocking the elegant garment. Take a look below in case you disagree!! She is an ageless beauty!